With the wait for the next exciting instalment in the Marvel Cinematic Universe‘s ever-expanding series of films still a few months away, London ExCeL and Marvel have teamed up, in a fashion not too dissimilar to that of Earth’s Mightiest Heroes, to deliver a fun, interactive event celebrating Marvel’s famous superhero team – Marvel’s Avengers S.T.A.T.I.O.N. Situated next to the famous site of many a comic-con, the S.T.A.T.I.O.N. may seem small and unremarkable aside from a few teasing Avengers logos, but inside, the event itself is wonderfully immersive and thrilling for anyone with a love or passion with The Avengers. 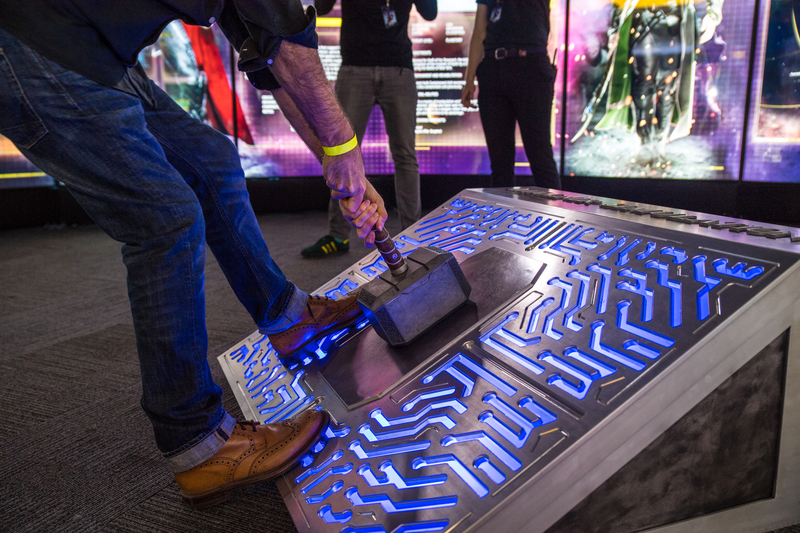 Following a loose narrative thread, the event location has been transformed into a unique test facility for aspiring agents to brush up on their skills and expertise before heading out into battle alongside heroes like Iron Man, the Hulk and Thor. After a brief video introduction and a security scan from Maria Hill (Cobie Smulders), guests are invited to enter the S.T.A.T.I.O.N, an advanced training facility for S.H.I.E.L.D’s ace team of agents. Here, there’s tons to see and do, with lots of interactive challenges, photo ops and displays to have a go at. 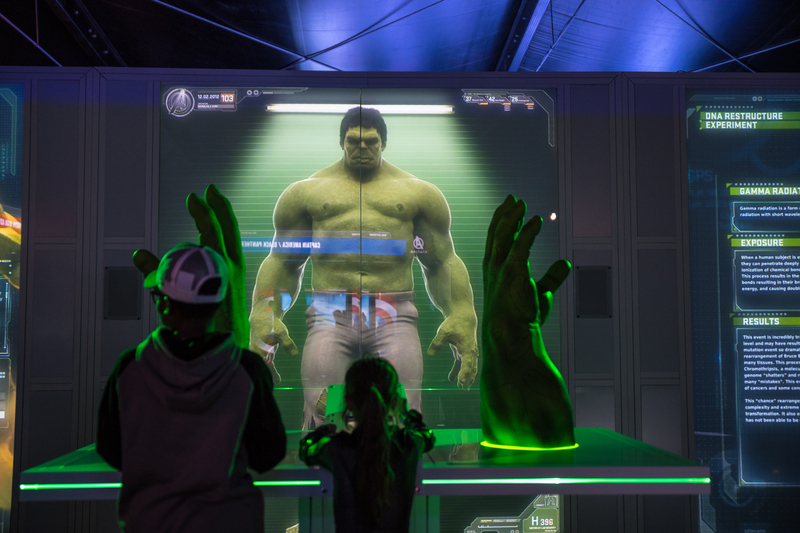 There’s a number of great activities on offer, including a chance to test your aim and reaction times with a series of touchscreen games, compare your strength to the heroes and villains of the Marvel universe, or even don Iron Man’s Hulkbuster armour in a very cool and very active VR experience. The real draw for MCU fans will no doubt be the various props, costumes and sets from the movie’s themselves, all of which are scattered around the facility. 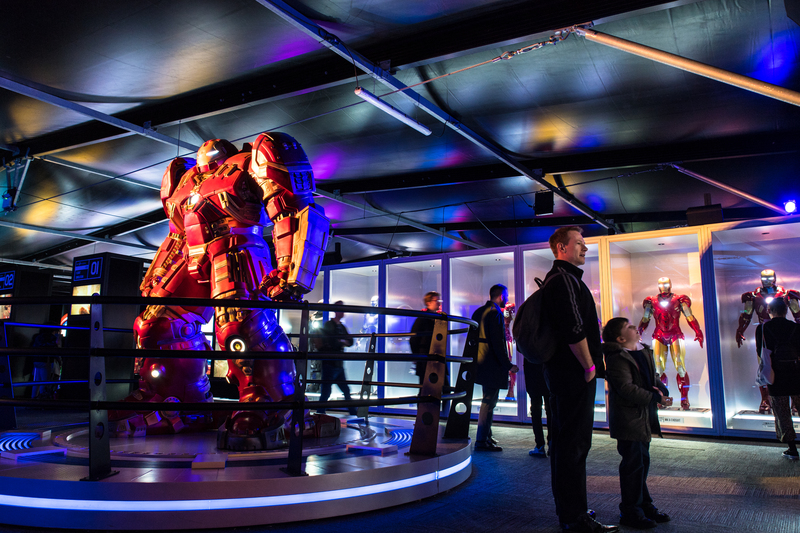 Particular highlights include the various Iron Man suits (including the iconic Mark I armour from 2008’s Iron Man), Black Panther’s helmet, Hawkeye’s bow and arrows, as well as the various costumes that cover most of the major players from the Avengers team. You can even hop on and pretend to ride Captain America’s motorbike from the opening scene of Avengers: Age of Ultron. Fans of the more recent films will notice a disappointing absence of props from Guardians of the Galaxy, Doctor Strange, Spider-Man: Homecoming or Thor: Ragnarok, with most of the items on offer coming from everything prior to, and including, Avengers: Age of Ultron (with the small exception of a few props from Black Panther). There are fewer exhibits then expected too, but all the key items and materials fans would most likely expect or prefer to see are present. Any feeling of being shortchanged is unlikely once the thrill of actually standing next to Cap’s shield hits anyway and I’m sure this is something they’d be looking to add to gradually. A treat for any Marvel fan, Marvel’s Avengers S.T.A.T.I.O.N. is a thrill from start to finish. With plenty of fun interactive exhibits for kids and an array of interesting items from the film’s themselves on display for fans to enjoy, all tastes are certainly catered for. Excelsior! Marvel’s Avengers S.T.A.T.I.O.N. runs at London Excel until 31 March 2019. Book your tickets now right here. Tags: Avengers Assemble, Avengers: Infinity War, Black Panther, Cobie Smulders, Hulkbuster, Iron Man, London Excel, Marvel Avengers, Marvel Cinematic Universe, Marvel Studios, Marvel’s Avengers S.T.A.T.I.O.N., The Avengers. Bookmark the permalink.